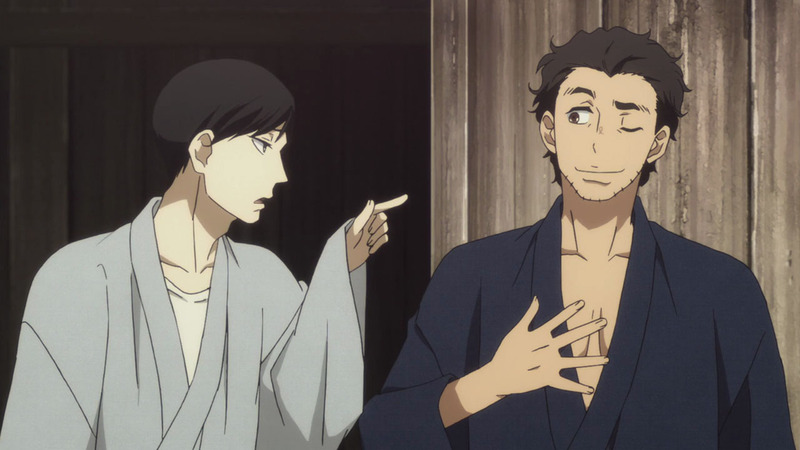 Rakugo is a performance art that I really don’t fully understand. The closest we would have would be a stand-up comic who tells a long and involved story, potentially exploiting the foibles and failures of people. Possibly the best example would be Arlo Guthrie’s “Alice’s Restaurant”. But rakugo is done in a very specific way, telling very specific stories with almost no variance from one telling to the next. “Shōwa Genroku Rakugo Shinjū” (“Shōwa Era, Genroku Era, Comic Storytelling, and Double Suicide”) is a double story. The first few episodes tell the story of Yotaro. He was recently released from prison and wants to become a rakugo performer (no, you don’t see him up there). In this time and place, being a barista might be a better career choice. Anyway, he tracks down the best rakugo performer, Yakumo Yurakutei (the one on the left, when he was younger; he was also known as Kikuhiko). Well, Yurakutei does NOT take apprentices, but the man is so earnest, and annoying, he takes him on, but with a lot of provisos. About four episodes in, we do a massive time jump, back to Kikuhiko’s earlier days, when HE wanted to be an apprentice and learn rakugo. His style was really stiff, as he aimed for perfection. His friend and fellow apprentice, Sukeroku Hasutaro (slob on the right), was more freewheeling and a tad rebellious. He was not willing to wait it out and slog it through the program, often jumping the gun to do rakugoes that only the seasoned masters could do, owing to the complicated nature of them and the characters they had to do. Kind of like driving a go-kart and thinking you can do Indy. Each show has at least one rakugo and potentially fragments of others, so you can see how this art form is to work. We also take these people from just before WWII and through the post-war concerns, to see how things fared afterwards, possibly up to the early 1960s. The fights between these two grow more and more pitched, as Sukeroku became more and more sloppy with his personal life as he was combative with his teachers. Although the show ended, they hung out a massive coupler point, so we are to await a possible second season (and while doing tweaking, I learned that is to be; by the time you read this, it will be out and potentially concluded). This show is not everyone’s cup of tea. Some folks might get turned off by the rakugo and feel it doesn’t serve a purpose, but it allows us to see the growth and maturation of these characters and how they pour themselves into these shows. I will admit that the jump back in time was such a jolt, I felt like I missed an episode or some clue this was going to occur, so it takes a while to recover from that and deal with the new reality. Also, some people may not understand or appreciate the traditions and decorum that goes along with this art style, so Sukeroku’s conflicts may come off more as petulance than commitment. Still, it is an anime on something you do not see that often. I did see a rakugo anime show a few years ago, but that was handled in such a different way that you honestly cannot compare one to the other. If you want something different than the usual mix of high school rom-coms and giant fighting robot vampires, give this one a try. And remember, it’s first run until you’ve seen it. Thank you for your continued support. Tagged Showa Genroku Rakugo Shinju.